It may sound silly but I find that killing frigana - the horrid thorn bush in which snakes hide - is really the most relaxing thing that I can do. Whether it be with poison or with my strimmer I become the grim reaper and could not be happier. 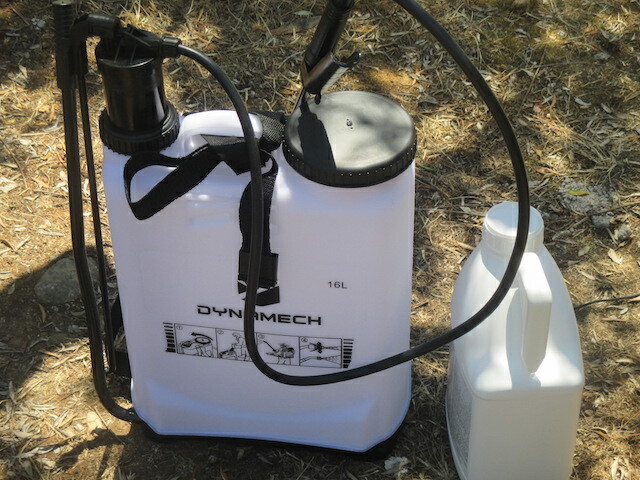 Today "Death" was armed with a brand new 16 litre spraying kit. One measure of poison from my 5 litre can (also pictured) for nine of water and off I went. The lever on the side must be flexed in order to build up pressure and then you spray away. Oh what joy. The strimmer brings the satisfaction of causing instant decapitation but the bloody plants just grow again. Poison takes a while but after ten days what was sprayed today will be a golden brown and on its last legs. Three years ago I used a strimmer only as the frigana was anywhere between waist height and my height and had to be slashed back carefully because of what might be lurking inside. But three years of slashing, burning and poisoning have left the 16,000 square metres of land at the hovel a very different place. And that in itself brings a sense of fulfilment. I have, with my own hands, turned a wildlife diverse jungle into land which can be farmed for olives and - longer term - for vegetables. It is land across which one can wander with clear sight of whatever wildlife diversity may be ahead of you, the diversity has nowhere to hide. These days there are whole patches that are frigana free. The plants that have grown back are mostly knee high. The industrial spraying by Nicho the Communist a month ago missed out a few areas entirely and the odd plant or row of plants elsewhere. So I am really just adding the finishing touches. Across our lands most plans are now golden brown, dead or dying. The only concern I have as I spray away is snakes so I tread carefully. But standing on a snake free spot, wearing an Olympiakos baseball cap left at the Greek hovel by the former owner vile Athena, I can then just spray away in pure joy. As the liquid falls on each plant i think of some Bulletin Board moron or share poltroon who has accused me of theft, tax evasion, child abuse, murder or whatever. I compare the frigana plants to the stockmarket villains I hunt in my day job. Maybe my poison is as weak as UK financial regulators in that just when you think a villain is nailed slam dunk or a frigana plant is drowning in poison and doomed, it goes away for a while but then comes back a year later to annoy you once again. I am not sure if I am winning the battle against stockmarket fraud but who cares? Two hours of poisoning the frigana sees me dripping in sweat but thoroughly fulfilled. In ten days I will be able to witness the tangible fruits of my labour. And there will be a tangible win. Tomorrow I can tackle a whole new swathe of frigana. I can feel my blood pressure falling already. This is the life.